The core of a natural latex/ natural rubber mattress is made primarily from tree sap or serum. The rubber tree (Hevea Brasiliensis) is an amazing plant. It generally has a life cycle of about 32 years. Rubber sap is harvested when the tree is 7 years old and can be harvested twice a day 365 days a year for an average of 25 years. When the tree is 32 years old it is usually cut down and the wood (rubberwood) is used to make a variety of furniture and other products like wooden toys. Another tree is then planted in its place to continue the cycle. 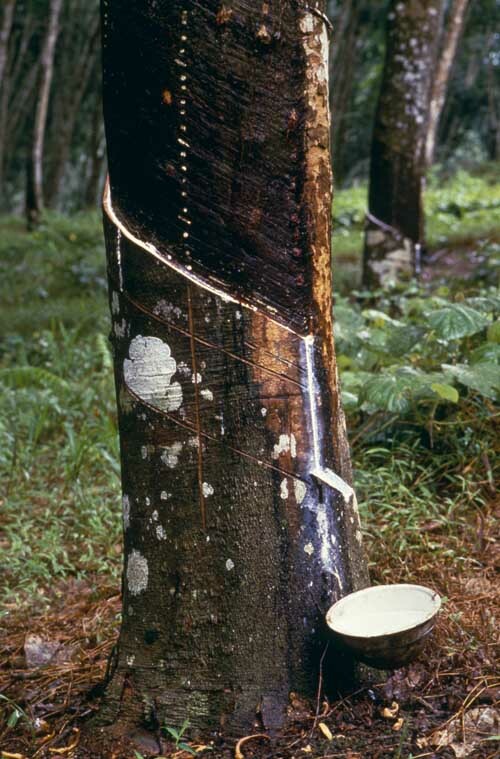 The collection of rubber sap is sustainable as it does not require chemical fertilizers or pesticides. The Hevea Brasiliensis rubber tree only does well in specific micro climates, similar to Vermont maple trees that are used for maple syrup. Rubber trees don’t really benefit from pesticides or fertilization; the major thing that is conducive to their growth and production is the climate that they reside in. Rubber sap can be processed into natural latex foam that forms the core of a natural latex mattress. First the sap is harvested, it is mixed with a small amount of soda ash and other natural ingredients, and then it is whipped and baked. Aside from natural latex rubber being a sustainable and eco friendly product, the mattress itself is made to last. Natural latex mattresses can last up to 20 years because it is very resistant to forming body impressions. This is compared to a conventional mattress that often needs to be replaced every five to ten years. In the long term, this means reduction of mattresses in the landfills.